On Tuesday, September 15 the Calcasieu Sheriff’s Office responded to a local middle school in reference to a complaint of cruelty to a juvenile. The investigation revealed bruises on a male juvenile student’s upper torso and on the right side of his rib cage area. The student told detectives a family member’s boyfriend, William Jones, 44, Moss Bluff had beaten him with a belt on Wednesday of the previous week. He also told detectives Jones had beaten him with a belt another time earlier in the summer. The student’s family member confirmed she was aware of the two incidents and for the 2nd incident she had rendered first aid on the bruises and kept the boy home from school for 2 days. 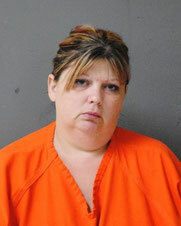 Alisa R. Ardoin, 36, Moss Bluff, was arrested and booked into the Calcasieu Correctional Center. She is charged with 2 cts. of cruelty to a juvenile. Judge Ron Ware set her bond at $30,000. An arrest has been issued for Jones who is out of state working. He is being charged with 2 cts. of cruelty to a juvenile. Judge Ron Ware set his bond at $80,000.